Kathmandu, April 14 (IANS) As many as three people were killed and three others injured on Sunday morning when a 19-seater plane crashed during takeoff at Lukla Airport in Nepal, officials said. There were no passengers aboard. 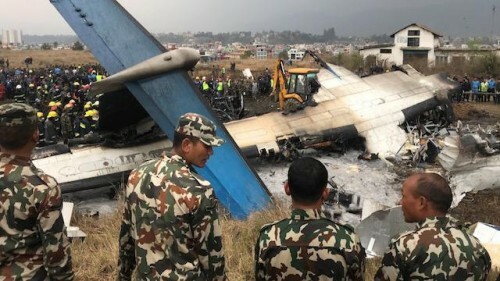 The Summit Air plane lost control and skidded to the right side of the runway while preparing for takeoff, Kathmandu's Tribhuvan International Airport Spokesperson said, reported Efe news. The plane crashed into two helicopters, parked some 30 metres from the runway, the official added. Images showed the aircraft had come to rest on top of a helicopter. Lukla Airport is the only airport in Nepal's Everest region. Nepali Police spokesperson said the aircraft's co-pilot and two police officials, standing near the helipad, were killed in the incident. The pilot sustained injuries and was stated to be in stable condition in hospital. In a statement on Facebook, the Nepali Police said additional details about damages were yet to be ascertained. Two employees of Manang Air, which owns one of the helicopters, were also injured, Kathmandu's Grande International Hospital spokesperson said. This is the second crash of a Summit Air plane at the Luka airport, the starting point of treks and climbing expeditions to Mount Everest from the Nepal side. On May 27, 2017, one Summit Air plane had crashed while trying to land, killing both pilots. The worst air crash in recent years in Nepal happened in March 2018, when a AS-Bangla, Bangladeshi airline, plane crashed during landing at Kathmandu International Airport, with 67 passengers and four crew on board. 51 people were killed in the accident.